Compression pants are pants made of a special blend of material, usually involving nylon and lycra that presses against your body to provide support and structure to your muscles as you work out. The compression given to your glutes, calves, and thighs can help to provide additional support and stabilization to your muscles as you work out. Maintaining your body’s natural alignment can be extremely beneficial when working out, especially if you have any kind of injuries or weaknesses, though you should always consult a doctor before using compression products such as compression sleeves, pants and other to prevent furthering any already present injuries. In this 2xu tights review, I’m going to go over a specific compression apparel. You’ll learn why. 1 What are compression pants? 3 See their price on Amazon.com! 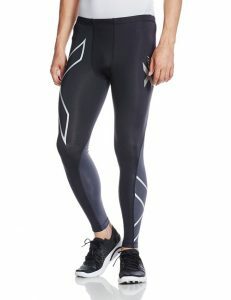 3.0.1 How to choose the right size for 2xu Women’s tights? 4 See their price on Amazon.com! 2XU Compression Elite Tights – for more serious athletes, more compression, different materials. The 2XU is one of the best compression brands. And elite compression pants are one of the best compression tights for running. They are made of a slightly different blend of material, still including a base of nylon. Elastane is the second material in the blend of fabrics that provides the extra compression you won’t find with normal compression pants. The material is actually more durable than regular compression clothing, though as with all clothing, washing it improperly can lead to damage or even shrinking that can be harmful to your body, especially to any injuries. The pants also are said to provide SPF50+ to protect you from harmful sun rays, but it only matters if you’re exercising outside, many people wear them indoors or under other clothes, so it doesn’t matter to them. To wash the pants, all you need is to put them in for a cold wash and then hang up to air dry. Drying the pants in a dryer can cause a lot of shrinkage. A downside is that the logo may fade or come off after a wash or two, but if you don’t mind the minor cosmetic change, they are still great pants in functionality. See their price on Amazon.com! 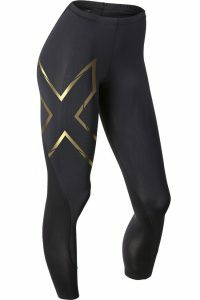 How to choose the right size for 2xu Women’s tights? If you aren’t sure what size you need to buy, you’re among many who struggle with online shopping, but compression pants are of utmost importance to get the sizing right otherwise, you may be cutting off circulation to the lower half of the body. Compression pants go based on height and weight rather than waist and inseam. The waist of these pants comes with a drawstring which eliminates any problem of it fitting in the waist area. Below I’ve got 2xu official sizing chart, for women’s models. A good thing to keep in mind is that the sizes for this particular brand ending in T are for above 6 feet tall and the sizes generally go up in increments of 20lbs for every 8 inches tall beginning at 65lbs at 4”9’ tall with an overlap of about 2 inches per size. This can be confusing to read and understand without a chart to reference, but if you can’t find a guide or chart, it may be helpful. For example, XXS begins at 65lbs at 4”9’ and ends at 85lbs at 5”5’ while XS begins at 4”11 at 85lbs and ends at 5”9 at 105. Once I put them on, I didn’t feel like I was losing circulation, but I definitely felt the pressure around my entire leg. The drawstring makes it very adjustable and comfortable, though having family members around the same size as you make’s it a pain when they want to borrow them! My workouts have been much more successful and I feel like I can get so much done without wasting energy. Even the day after an intense workout, I’m able to get back up to exercise again once I put on the pants. They really do help with blood flow and support because of the intense compression. A downside to the compression is that it can be pretty difficult to get your feet through. My feet have always been wider than my moms and I have noticed that she has an easier time getting her feet through than I do. Overall, the pants are comfortable, cooling, and provide a lot of needed support. First of all, I have to mention that these are graduated compression tights. What that means is they increase in compression starting from the lower part of your leg up until your waist. Which sort of helps with the blood flow going towards the heart. In simple words – they make pretty good recovery tights. The Material is soft and really give’s you the second skin feeling everyone is looking for when buying best compression tights. Many people that do jujitsu know that there’s a lot of rolling and where there’s rolling – there’s ripped sports garment. If you’re willing to spend a little more money, the material will hold up through a lot more than regular compression clothing – it’s quite durable. As I mostly use these for martial arts and gym – I ‘ve noticed that 2XU tights fabric helps, particularly well (I’ve tried other tights as well), in drawing the sweat away from the body. They don’t leave me feeling gross and sweaty at the end (like some of the others do), even with the second layer on top (for me – gi). However – I’ve noticed that these work great as long as the weather conditions aren’t extremely cold. If you’re planning on using these for cross-country skiing, I would go with the thermal ones, or at least wear sweatpants over them. Just don’t use them as a base layer. Just like the women’s model washing these pants is pretty easy, just give it a cold wash and hang dry. However, a downside, that I’ve noticed is that the logo faded and came off after just a few washes, but since I don’t mind the minor cosmetic change, I still wear them every time I work out. You wear them as outerwear. Well mostly. If the conditions are unpleasant you can wear them as base layer pants however, then you won’t be able to enjoy all of the benefits. Also, for the record – it’s not a swimwear. For compression pants, the size is the most important thing to consider. If the pants are too big, they won’t provide proper compression. If they’re too small, they may cut off circulation or damage your muscles. A really good thing about the 2XU pants is that the waist comes with a drawstring which eliminates any problem of it fitting in the waist area. Compression pants go based on height and weight so each brand will be different. The sizes for men generally go up in increments of 20lbs for every 8 inches tall beginning at 65lbs at 4”9’ tall with an overlap of about 2 inches per size, with exception of the sizes for T, which are for people above 6 feet tall. If they fit properly, you should feel a tension in your calves, thighs, and glutes, but it shouldn’t feel uncomfortable or painful. If you’re able to easily fit one or two fingers between your skin and the pants leg, it’s a good sign that it’s the size you need. It would be best to consult each brand’s website for a sizing chart that way you can get the exact measurements you need to ensure the best fit with the least hassle. 2XU tights come in a box, folded neatly inside, which is perfect because it protects the pants from any damage in the shipping process. Compression pants shouldn’t be punctured or stretched in any way that they aren’t supposed to be, so the extra security is impressive and comforting. Simply put, 2XU compression tights are top of the line athletic gear. The graded compression improves athletic performance and speeds up recovery time: two features that are essential to any serious athlete. They’re also highly durable and keep you dry and comfortable during physical activity, which means you won’t wear them out in a hurry. That’s good news, considering that they can be a bit pricey. However, if you’re serious about increasing your performance, they’re worth the money.